After Wally's debut in the motor-yacht sector with the Wally Power 118 and smaller ones, including the Wallytender and Wallydinghy, they are preparing to launch a new yacht. As with the rest of the range, it stems from a well defined design philosophy that is expressed with cutting, futuristic lines, state of the art technology and hi-tech material. Furthermore, another characteristic element of the power production is the delta shape of the hull, similar to the one found on the sailing vessels that made Wally a world famous name. It is the Wallypower 55m developed by the internal design department at the WallyDesign boatyard. 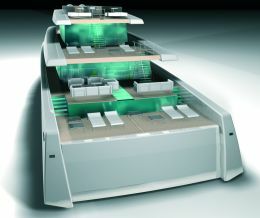 Apart from the design that bears a particular resemblance to the 118, this model adopts a new displacement hull built in high tension steel especially developed in the towing tank and on computer at their internal R&D department. They have drawn from, among other things, their hydrodynamic experience gained in the military sector. The results of these experiments in the towing tank and the research carried out using sophisticated CFD software, guarantee greater efficiency compared to the traditional hulls, as well as a considerable reduction in pitching motion. Furthermore, the high freeboard makes the WallyPower 55m extremely safe in rough seas. The Wally 55m is fitted with the DATUM control system and the VT Najad Marine roll stabiliser system that, together, improve stability both during navigation and at anchor. The superstructure made in a particular aluminium light alloy has a vast glass surface; as well as providing plenty of light inside, it also allows those on the upper decks to enjoy a 360§ view of the sea. The subdivision of the five decks has been designed to optimise living conditions on board, in particular, to ensure privacy between the areas reserved for the owner and his guests and the crew's quarters. The latter's sleeping area spreads along the lower deck and includes eight double cabins plus one reserved for the captain. The main deck houses the guest cabins, four doubles with en suite bathrooms, the main lounge and hangar holding three different sized tenders, a small sailing boat and other equipment. The main lounge, covering an area of 80mý, was created by applying the internal-external living concept so dear to Wally. Basically, you can directly access the stern terrace from this area, where there is a sauna, shower and wardrobe. The main deck offers a 60mý suite at bow for the exclusive use of the owner, while the remaining area offers a luxurious dining and relaxation area adjoining the stern veranda. The upper deck includes the steering area, a gym with sauna and two terraces overlooking the sea, one at bow, the other at stern. The last deck is dedicated to open air activities and offers a sunbathing area, dinette and Jacuzzi. The layout of the rooms on this WallyPower introduces the boatyard's new concept regarding open air living areas on each deck, especially in the main areas at bow that are much more ventilated that the classic living areas at stern. For further information: Wally; 8 Av. Des Ligures; MC98000 Pricipality of Monaco; tel. +377 93100093; fax +377 93100094; web site www.wally.com. Power plant: 2x2.012 HP Caterpillar 3512 B.